When the concern is for lack of affordability in the market, this gives rise to the option of renting. With Odoo Website Rental Sale you may provide your customers a lot of flexible Offers which will definitely help you to boost your sales figure. 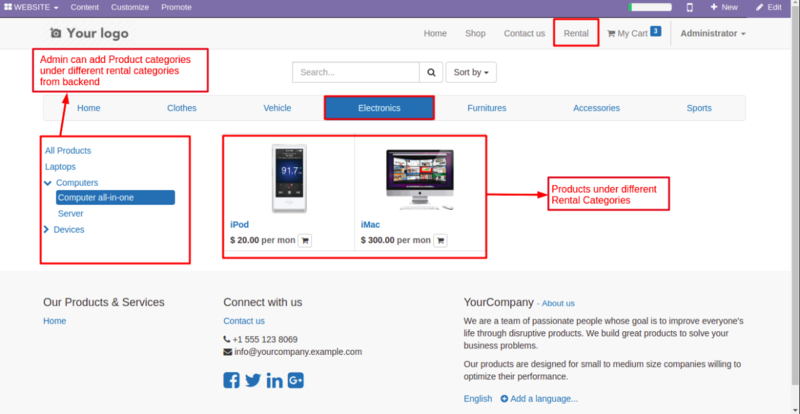 Odoo Website Rental Sale module enables the rental feature in Odoo e-commerce website. Customers can purchase a product on rent with some tenure value for a period of time. A security amount will be taken for a period of time and that will be refundable after the tenure when the product will be returned back. 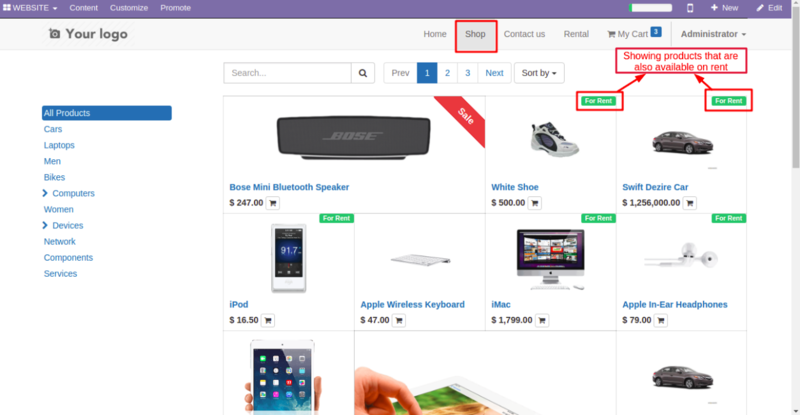 Odoo Website Rental Sale module provides a facility for customers to buy products on rent. 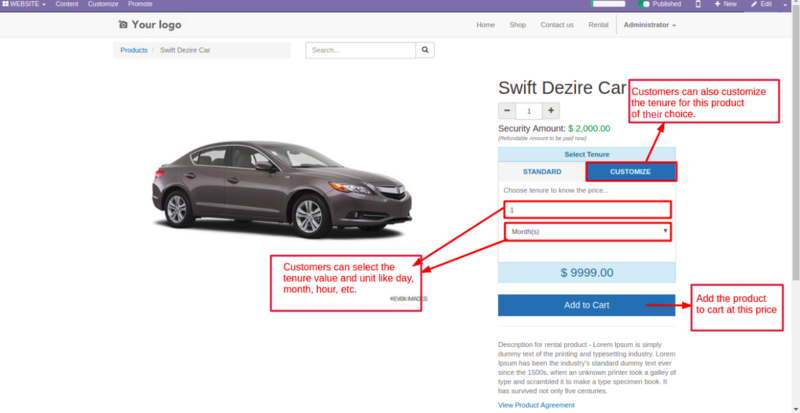 The customer can select tenure value with the offered amount and add the product to cart with that amount. Admin can offer both standard and customized tenure for customers. He can also offer different tenure on products like hours, months, years, etc. Admin can select in the backend for the different tenure to be shown on the website. 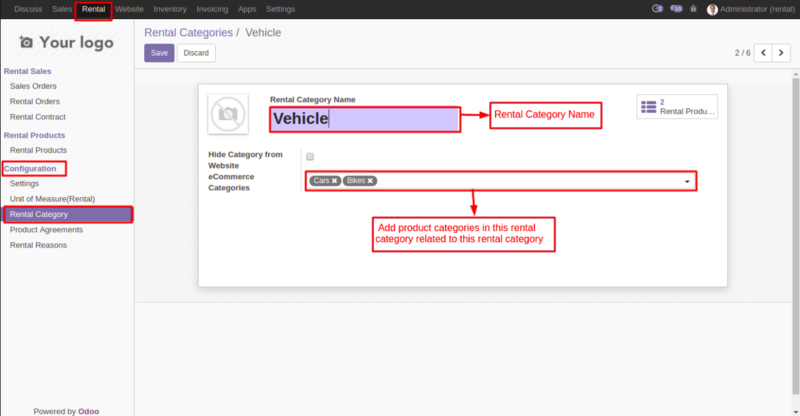 Rental Categories are managed in this module. Also, admin can add an agreement pdf file to show the agreement to customers. 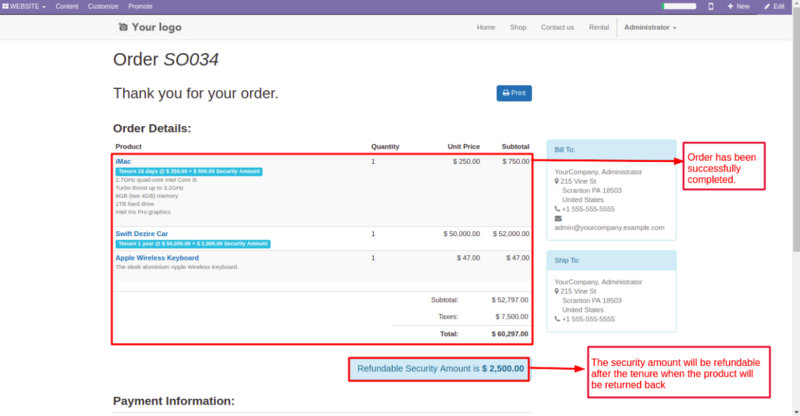 Admin can add a security amount for each product which would be refundable after the tenure. 3. 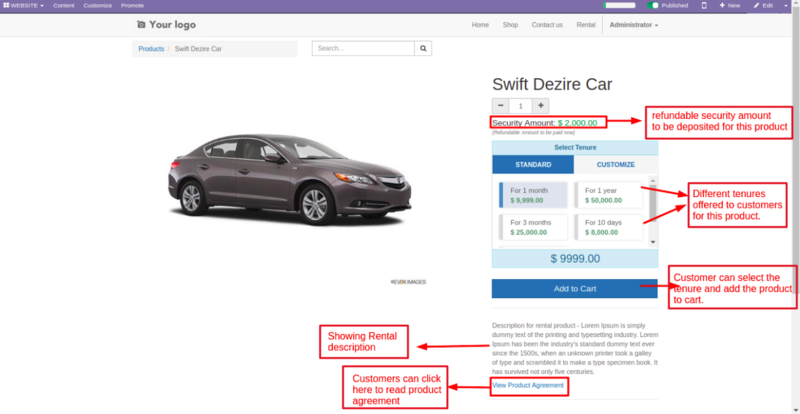 Remove the app’s filter and search for the odoo_website_sale_rental key. 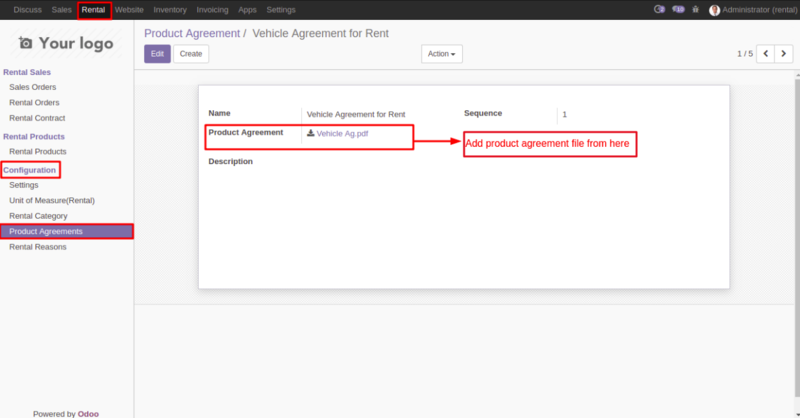 Admin can add records of product agreement for the rental products from the menu Product Agreement under the Rental tab. Inside the Product agreement, the admin can add the agreement pdf file for customers. 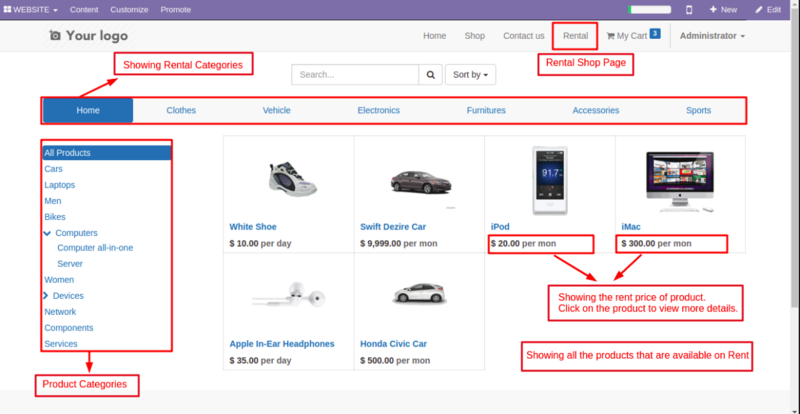 Admin can add Product categories related to this rental category which will be further displayed on the website. Admin can also hide this category by simply enabling the Hide category field. 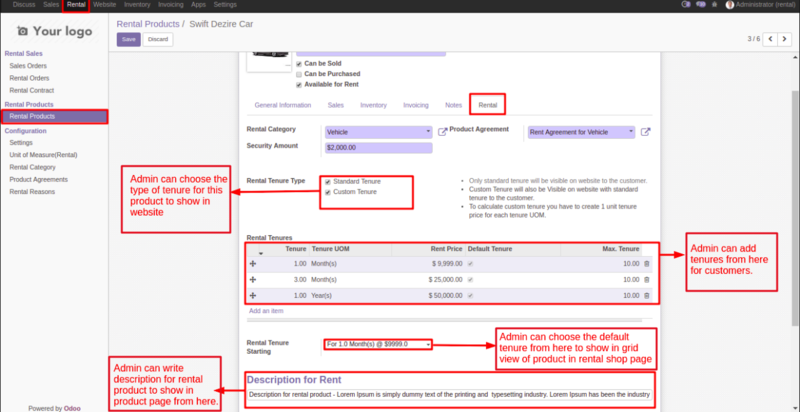 Under the Rental tab of rental product, the admin can enter the details such as Rental category, security amount, define product agreement, rental tenure type which can be either Standard or Custom. 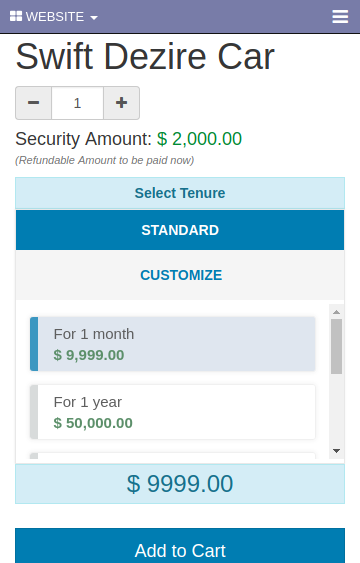 Admin can add different rental tenures for the related product and can select the default tenure to be displayed on the website. Also, you may write a detailed description of the corresponding rental product. Rental Product menu will be visible on the website. 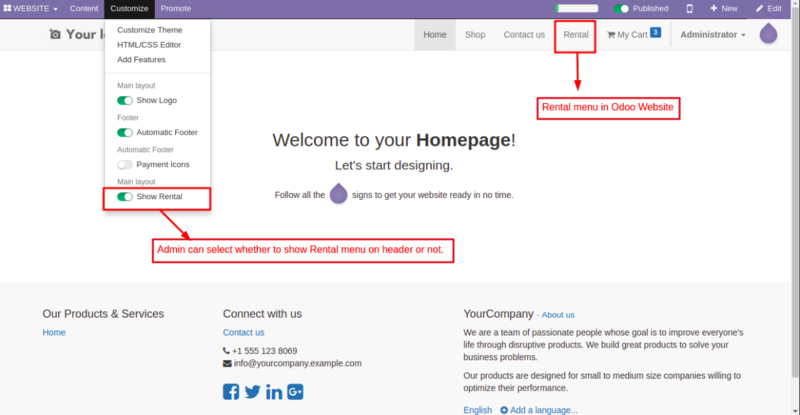 The admin can easily enable the view of rental option from the website by enabling or disabling the layout: Show rental. Rental Shop page showing all the products that are available for rent. Hence all the rental categories will appear on the site providing ease to your buyers. Customers can choose Rental Category and their corresponding product categories to view the desired rental product. All the necessary details regarding the rental product will be displayed to your buyer Customers can select the standard tenure and add the product to cart. Also, there will be a link available which will show the products rental agreement. Customers can also customize the tenure and adjust the tenure value according to his need before adding the product to cart. The customer can easily differentiate the rental product from the normal products. 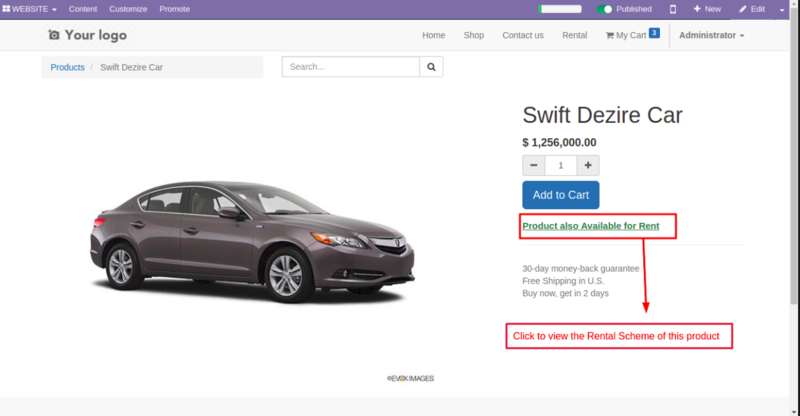 A link will be visible on the product page if the product is also available for rent. Hence On clicking which the customer can buy the product on rent if the product is out of is budget then he will definitely check out the rental scheme. Product added to cart with the selected tenure and rent price. 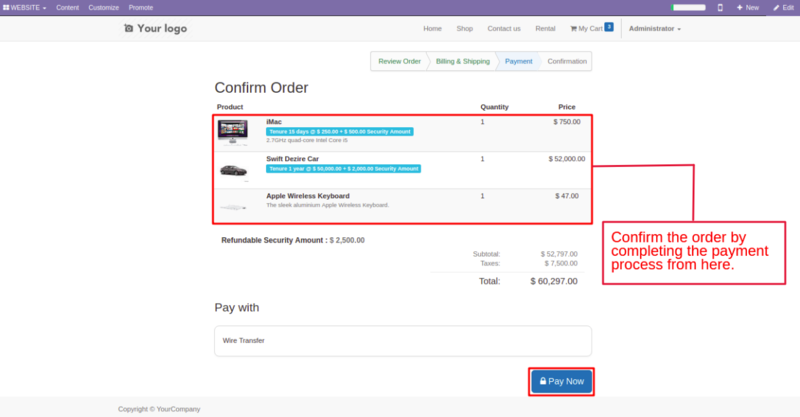 The customer can make the payment and confirm the order. Once order has been confirmed. 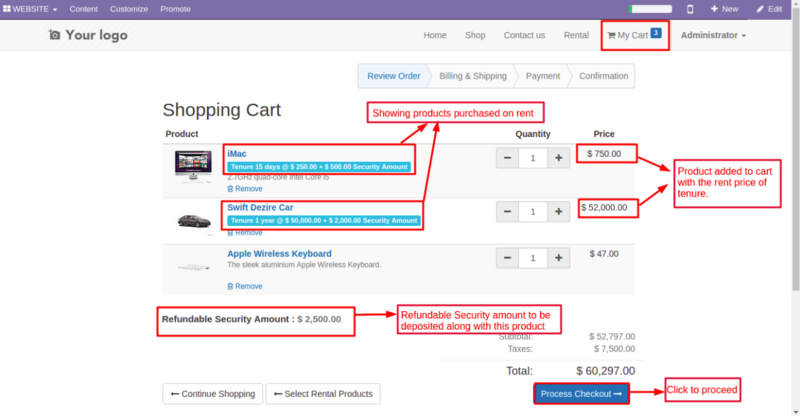 The security amount will be displayed just below the order and will be refundable once the product is returned. Also compatible with mobile view.